This may seem a silly thing to be thinking about at 5:39 am on a Sunday morning, but I have a mind with a few little unique wrinkles. My way of saying I'm a little weird. There's an idea that's been knocking about in my head for a few days. I generally rely on motorized carts to get me around stores. Anything larger than a typical convenience store, and my knees and hips, sometimes my ankles start hurting so badly I want to scream or cry. On at least one occasion I did cry from the pain. when stores don't have them, or don't have enough of them, my husband has to push me in the wheelchair, with me pushing the shopping cart, which is hard on him as he is aging and has high blood pressure and a bad knee which was repaired poorly after and ACL tear. So I favor stores with a fairly large supply of shopping carts: Randall's, WalMart & HEB come to mind. Kroger sometimes has enough, sometimes both of them are gone. ALCO has one, and I almost always can count on getting it. If not, they have a wheelchair with a basket, which has to be pushed. One of the major disadvantages of the standard motorized cart is that eye level is about the second shelf from the bottom. With bifocals, reading labels, prices, etc. on the higher shelves requires a neck contortion I can not do. I'm not sure a person without RA could do it either! Maybe that TV ad character with the flip top head could. A few days ago, my husband and I stopped into a WalMart at Wirt and Long Point in Houston. Sitting in front of our parking space was a cart clearly designed for a child, but what appealed to me was that the seat was large enough for an adult and up high. So I climbed on for a test drive and my husband pushed me into the store, intending to return the cart to its storage spot and get a motorized one. However, as soon as we entered the store, I discovered a huge advantage to this cart for me. I could see the upper shelves! I could also see the signs over the aisles sooner. So we conducted our quick, and fruitless (they didn't have the product I wanted at that location) trip with me in the kiddy cart. Of course, there a few disadvantages. The seat was really too flimsy for an adult weight. There was some steering problem which might have been related to this weight issue, or might have been related to the problem one often has with older carts where the wheels twist around and stick in a non-optimal position as it ages. At any rate, I started dreaming of the "ideal" cart. I found some great things on the web, like this bicycle shopping cart, but no image of the cart I rode in at WalMart. I guess I'll have to call up there and get some information. or go up there and take pictures. I've never seen anything like it anywhere else. 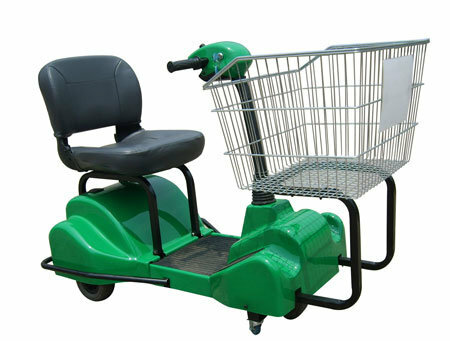 With a few modifications, I think it might be the ideal shopping cart for the disabled AND children.